Drying ovens are also used to reclaim metals from contaminated metallic composites. This oven is designed to heat clean different types of industrial materials. Once they are cleaned, they can be reused or recycled. These industrial heating ovens are completely automated and performs the drying process quickly and efficiently. It provides uniform heat with a low, surrounding air temperature in the oven. The drying process is performed within a rotating, stainless steel, low-intensity, infrared emitting retort, which is heated externally. The retort’s rotation allows the materials to tumble and amalgamate. The speed of the retort rotation helps control the oven’s temperature. Drying for reuse or recycling. Drying oven and accessories are modular in design, enabling low installation costs. 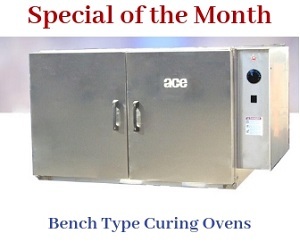 The oven’s afterburner chamber provide excess air for complete combustion of all contaminants. Any discharges into the atmosphere are harmless by products of combustion. The oven’s design and operation conform to EPA air emission standards. Retort consists of heat resistant, stainless steel alloy tubes, with internal flight to transport materials from feeding, to heating, and out-feed zones. Automatic controls allow for a specific set point to be maintained throughout the drying cycle. Time and temperature are automatically controlled and shut off at the end of the process cycle. A variable speed drive knob to adjust retort speed is installed. A digital microprocessor temperature controller maintains the set point temperature by reducing or increasing the heat zone fire. Excess temperature controller with manual reset option shuts off burner heater when the temperature rises above the set point. 11 Ga. corrosion-resistant barrier in oven interiors. Insulation: 4″ of 2,300°F, to prevent outside enclosure temperature from exceeding 140°F. Insulation is protected by 16 Ga. expanded metal.